See pictures of Breanker below and then be sure to look at our 360-degree views of Breanker as well as our page of specifications. 1- Guest Cabins. 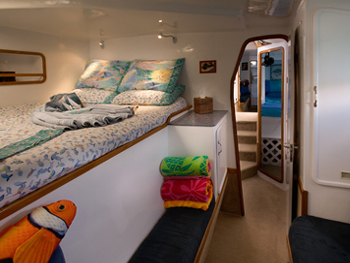 Featuring queen sized berths, a small settee, hanging locker, mirrors, fans, ports, overhead hatches and air conditioning. 2 - Ensuite Heads. 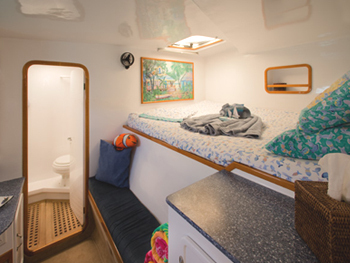 Featuring showers, mirrors, medicine cabinets, ports and overhead hatches. 3 - Main Salon. Featuring seating for all. 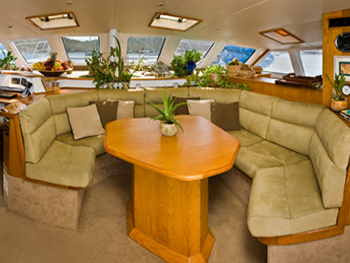 Enjoy dining, TV/VCR viewing, music, dancing and view of a beautiful anchorage. 4 - Nav Station. Radios, phones, computer station and all the gadgets. 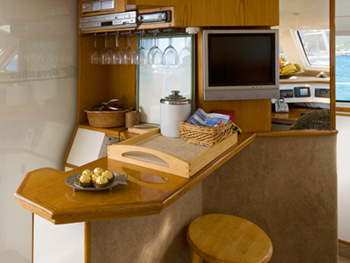 5 - Wet Bar. Your Captain will work wonders on your spirits. 6 - Galley. Your Chef will work magic before your eyes!